Innovation , quality and good service are basic ingredients for any food business . Mr M Mahadevan learnt these traits early in bakery business . Hot Breads has been popular bakery cafe many part of world . When I tell M Mahadevan that I want to talk to him over lunch, he asks me where I would like to eat. I have a choice of over 30 restaurants and 30 bakeries co-owned by him in Chennai. The fact that I am a vegetarian makes the choice easier. I opt to meet him at Cream Center, the highly popular pure vegetarian eatery, where it is difficult to find a place if one goes late, especially during dinner time. 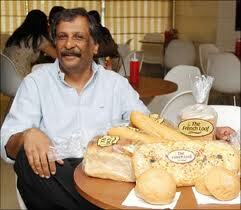 Mahadevan, also known as 'Hot Breads' Mahadevan, is waiting for me at a corner table. He urges me to order a fruit cocktail and chooses a fresh lime and soda. The waiters hover around us, and the restaurant manager and chef come around to say hello. Mahadevan knows them all, their names and has easy conversations with all of them. "I love food and enjoy people. So this is a natural choice of business for me," he grins. "Food has to be a passion in this business. I tell my boys, enjoy food, and cook with passion and love. To retain people is an art. My chefs are like my family members.